Here’s where conversational analytics comes in to help brands derive deep, actionable insights from these conversations. “We rely on our 250+ sales contact center for revenues. Although our customers use all channels, phone was the primary means of communication. We noticed huge penalties to the tune of £3,00,000 per year and also got some negative reviews from agitated customers on review sites. We had to listen to our customers and act upon it”. Customer sentiment was low and because of 2-3% conversations being audited, there was a gap in evaluating agent performance, training and compliance audits.In such a scenario, conversational analytics works to acquire 100% of customer conversations from all channels, transcribes speech data to text and runs analytics to derive the voice of customer objectively. 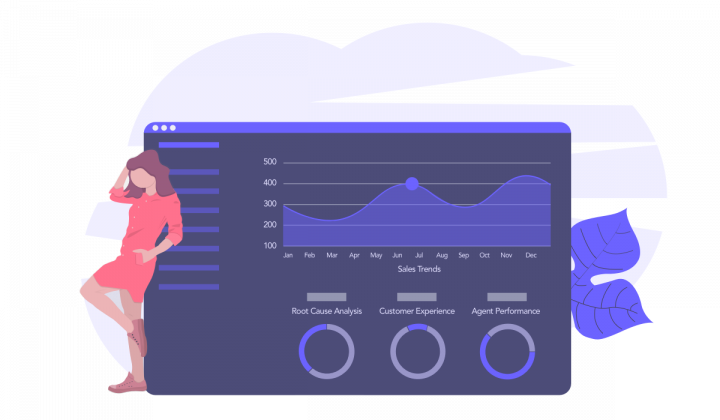 Conversational Analytics helped move audits from random 2-3% to 100% and showed ultrapractical insights into why the customers were agitated, why the sentiment was negative and why review sites were seeing a decline in scores. Once the insights were given, decision-makers could take effective steps to fill knowledge gaps in specific agents by running tailored training modules, move audit scores to 100% and avoid compliance violations and penalties and move their low performing agents to premium thereby increasing productivity. This also helps the brand understand competitor metrics and decipher why the non-converted leads have gone to another competitor. Call Classification and Root Cause Analysis have made it easy for a decision maker to see where the loopholes are and take necessary actions to fix it.Marketers use this information to create more personalized and relevant content to retain customer bases and also create new pipelines for the sales teams.A Gartner CMO Spend Survey reported that customer experience is the top area of innovation being pursued by marketing leaders. Conversational Analytics are proof that investments in this area have significantly improved customer satisfaction, productivity and sales while also positively impacting brand strength.It’s high time that companies moved from relying on surveys and social media for feedback while 90% of conversations are still happening on phone. Conversational Analytics comprehensively provides invaluable insights into all channels thereby helping companies deliver better customer experiences.